I received copies of Unsaid for review and giveaway from the publisher and due to the timing, I'm opting to "preview" the book for you as opposed to review it (read: I know I won't be able to get through the book any time soon and I certainly don't want to put off your chance to win a copy!). I will say that I absolutely adore the cover... and we all know how you can judge a book by it's cover, right? About the Book: Does love transcend all boundaries — including those of death, time, and memory? Is the connection between humans and animals stronger and more real than we’ve ever imagined? In Unsaid, Neil Abramson skillfully weaves these questions through a moving story that will touch the heart while stimulating reflection and debate. Upon its publication in hardcover, Unsaid garnered outstanding reviews from readers, booksellers, and critics alike, and film rights have been optioned to Nick Wechsler (The Road, Time Traveler’s Wife) by The Gotham Group on behalf of Jeff Kleinman at Folio Literary Management. 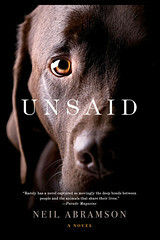 Unsaid is told from the perspective of Helena Colden, a veterinarian who has just died of breast cancer. Helena is forced to witness the rapid emotional deterioration of the beloved husband she has left behind. With Helena's passing, David, a successful Manhattan attorney, loses the only connection that made his life full. He tries to carry on the life that Helena had created for them, but he is too grief-stricken, too angry, and too quickly reabsorbed into the demands of his career. Helena's animals likewise struggle with the loss of their understanding and compassionate human companion. Because of Helena, David becomes involved in a court case to save the life of a chimpanzee that may hold the key to unlocking the mysteries of animal consciousness. Through this case, all the threads of Helena's life entwine and explode - unexpectedly, painfully, beautifully. An evocative first novel about the healing power of animals, Unsaid will resonate with anyone who has experienced loss, has loved a pet, or has pondered the meaning of those things that remain “unsaid” in life — but mean so much. About the Author: A partner in a Manhattan law firm, Neil Abramson lives in Westchester County, NY and is married to a veterinarian. He is also a past board member of the Animal Legal Defense Fund, an award recipient from the ASPCA for his legal work on behalf of animals, and a founding member of the New York City Bar Association Committee on Legal Issues Relating to Animals. Unsaid is his first novel. Visit his website to learn more. Leave a comment here answering this question: Do you judge a book by it's cover? Why or why not? Has it paid off? Winner(s)* will be selected by random number generator. *If this post receives less than 20 comments, one copy of Unsaid will be given away. If 21 - 35 comments, two copies will be given away. If 36 or more comments are received, three copies will be given away! I do judge a book by its cover. If the cover is a dark and spooky looking thing, I know I won't like it, because horror stories bother me greatly, insomniac that I am. And besides, who wouldn't like a book with a cute dog on the front? The cover is what gets me to look at a book in the first place, and I study the description, too. Reviews such as those found on Amazon carry less weight, because everyone thinks about things differently. I do judge a book by its cover, but not exclusively. This one, though, I would grab in a heartbeat. What a sweet looking pup! I read the book jacket and I rely on friends' recommendations to select the books I read. I do just a book by its cover, one time I didn't and it sucked! If the cover, jacket, or first page isn't great than I won't read it. I once gave a chance to a book that lacked in all three areas, and sadly..the insides of the book lacked as well. However if we to refer to judging a book by its cover in the sense of other things than books, than no I do not judge people or animals by their cover or what others say about them. They all have good (or bad) insides I want to find out for myself with no outside influence. I would definitely look at the internals of a book depicting such a beautiful dog. Then I would find that it is a story about animal rights, love and grief. I would then read it. The cover doesn't matter to me at all, and even less so now that I use e-readers. I'm often attracted to a book because of it's cover, but they don't always live up to the original attraction. I'm supposed to be doing a book review and I need to get with it soon. No, I do not judge a book by its cover. I usually do research on books I read, so I don't make impulse buys based on the cover.